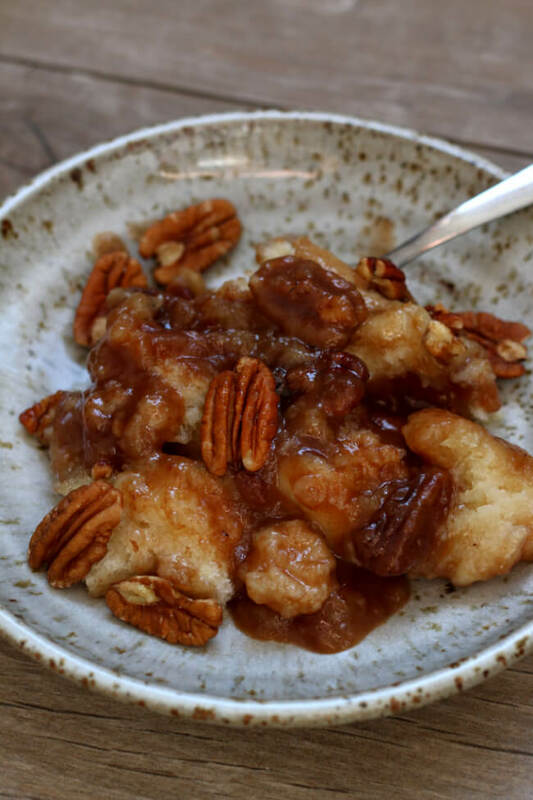 Instant Pot Praline Pecan Cobbler–a gooey, caramelly praline pecan cobbler dessert that will blow your socks off. With a scoop of vanilla ice cream or whipped cream it tastes like heaven in your mouth. A few weeks ago my husband and I visited Nashville, Tennessee for a few days. We were told by friends that we must eat at a restaurant called Puckett’s and order the skillet pecan cobbler. We did as we were told and have been dreaming of that dessert ever since. Let me get one thing straight. I would choose a dark chocolate brownie and ice cream over any non-chocolate dessert about 99% of the time. But after trying the pecan cobbler at Puckett’s I was blown away. I’m not a nut fan and I’m not even a pecan pie fan but this dessert was to die for. So of course I had to come home and try to recreate it to the best of my ability. And I must say that it turned out pretty darn good. My husband said, “this is just as good as what we ordered at the restaurant!” I agreed. My version was a little more moist, like a bread pudding. 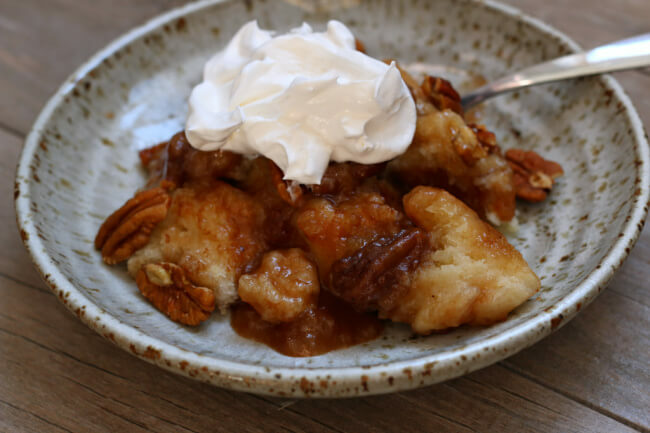 The restaurant’s version was more of a traditional cobbler. But both were good. However since we don’t have a Puckett’s in our neighborhood we will have to live with the homemade version until we can visit Nashville again. I would love to know if you like this dessert as much as we did! Please try it soon and let me know what you think. 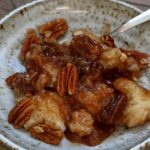 To make Instant Pot Praline Pecan Cobbler I used my 6 quart Instant Pot Duo 60 7 in 1*. I love this Instant Pot because it has the yogurt making function which I use almost weekly. It has two pressure settings (high and low), and there are also little slots in the handles so that you can rest the lid there instead of putting it down on your counter-top. 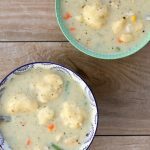 You can also use an 8 quart Instant Pot to make this recipe. I used an OXO sling/trivet* to lower my pan into the pot and to get it out. This sling is so handy for so many recipes. For example I used it for Instant Pot Taco Meatloaf the other night. The cobbler was baked in a 7 inch by 3 inch Fat Daddios cake pan*. You can also use a bundt cake pan for this recipe. 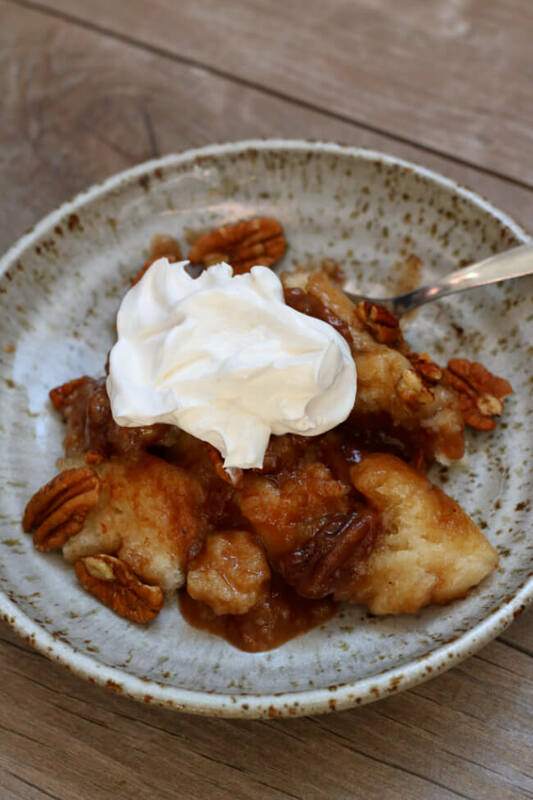 A gooey, caramelly praline pecan cobbler dessert that will blow your socks off. With a scoop of vanilla ice cream or whipped cream it tastes like heaven in your mouth. Pour the melted butter in the bottom of a 7 inch cake pan*. Sprinkle 1 cup of the pecans evenly over the butter. In a medium bowl mix flour, baking powder, salt, sugar, milk and vanilla. Stir to combine, but don’t over-mix. 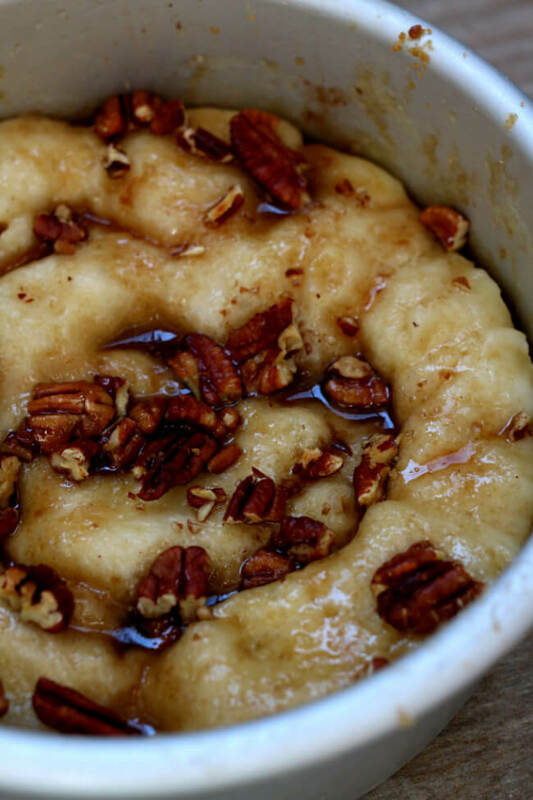 Scrape the batter out of the bowl and spread it evenly over the pecans. Sprinkle the brown sugar over the top of the batter. Pour boiling water over the top of the brown sugar. Don’t stir. Pour 1 ½ cups of water into the bottom of your Instant Pot. Loosely top the pan with a square of foil to prevent drippage on the top of the cobbler. Lower the cake pan into the bottom of your Instant Pot with a trivet or sling*. Cover your Instant Pot and secure the lid. Make sure the valve is set to sealing. Set the manual/pressure cook button to 28 minutes on high pressure. When the time is up perform a quick release or let it sit for 5 minutes and then perform a quick release. Optional: remove the foil and place the cobbler under your oven’s broiler for 3 minutes to brown up the top of the cake a little. 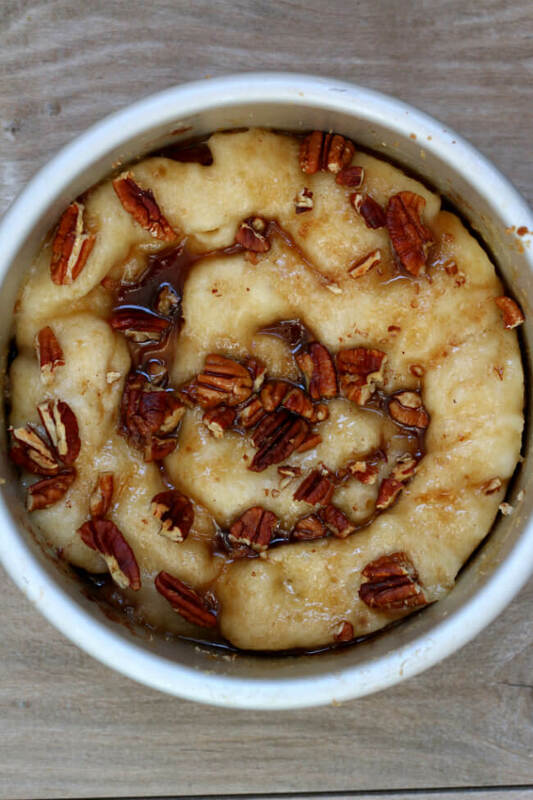 Top the cobbler with the rest of your pecans. Scoop servings out and top with whipped cream or vanilla ice cream. Praline Pecans are pecans that are coated in a sweet and crunchy coating. I found a can of praline pecans are Smith’s (Kroger). They were with the other jarred nuts and were the Private Selection brand. They are super tasty! Any idea why mine failed? When I removed the foil, tons of water remained floating on top. I poured 1 cup water over the brown sugar. I poured 1.5 cups of water into the bottom of IP. So disappointed it failed, as pecans are expensive. After 28 minutes, it was only half cooked. What type of pan did you use? I have made this at least 4 times in the last 2 weeks! So easy, and SO good!! The investment of Instant Pot accessories is worth every penny for this dessert, and the cheesecake. I love Karen and Greg’s recipes. So family friendly. Wow Thanks so much LuAnn!!! I have a 3 qt .. how could I modify the recipe? do you have a pan that will work for pot in pot cooking? Glad to hear! I love it. I have a Duo 8qt Instant Pot and I am wanting to purchase the Fat Daddio’s 8 x 3 cake pan…Would the cooking time or amount of ingredients change? I’m also wondering if I could use this pan for cheese cake. I don’t mind if the crust isn’t perfect. I bet you would be fine. I would just increase the water in the bottom of the pot to 2 cups. The pot will take longer to come to pressure but it should be fine. Let me know how it goes. Hello I have read your recipe for instant pot and slow cooker . Do you have just plain oveninstructions. I look forward to reading other recipes on your site . No I don’t but you could make it in the oven at 350 for 30-35 minutes. Let me know how it works out! 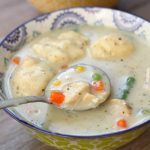 I just made one of these and baked it in the oven, after making it in the instant pot last week. 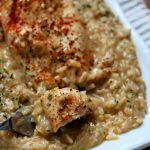 The oven version was as good as the instant pot one! Hooray! I’ve made one in the oven too. They are different but both are tasty. 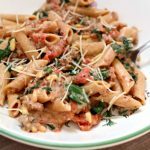 I tried this right away and OMG….I couldn’t believe how delicious it was!! It was my first time trying a ‘dessert food’ in my Instant Pot. The only thing I did different was I added some ground cinnamon in the melted butter and also in the flour mixture. It was perfect!!! um yes…those things are so good! like candy! I was thinking that cinnamon would be good to add! Can you make it in a crock pot??? 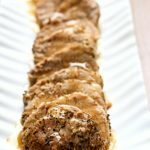 I would love a version of this recipe for the oven or slowcooker. I do not have a instapot. I love your blog. I have done many of your recipes. Just wondering why you don’t use a ninja foodie.. It would crisp the top without putting it in the oven. 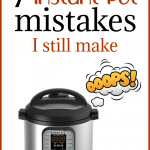 I just have Instant Pots. I’m not familiar with ninja version. I’ll have to check it out. Check it out!! Ninja foodie Pressure cooks. air fry ,saute,dehydrates, bakes, broil,steams and slow cooks. I passed on a instant pot to get this four months ago and i love it. I wonder how it would change the outcome if I used yellow cake mix as a topping or perhaps store bought biscuits or polenta (I have a chickpea polenta in the fridge ). I’d like to cut back on the white sugar. the cake mix might work but I’m not sure about the other ideas. oh my gosh I seriously typed out cobber like 50 times and it was supposed to be cobbler. I need a nap!